11 June 2012 — Over the last twelve months, we tried something few sane software developers would ever contemplate: the release of a new version of our flagship product on the same day of every month. Who would ever commit to such a crazy schedule? The art of writing software — particularly when it comes to fixing bugs — doesn’t follow a schedule. But we committed to monthly releases so Helix RADE users could see steady, visible progress. And with the exceptions of this last month, plus a six-day delay in January, we made every one of those deadlines. Our overriding objective has always been to get to a place where Helix users could use RADE without having to go back to Classic, while at the same time, maintaining full backward compatibility so that you could go back to Classic if the current state of macOS RADE Design Mode wasn’t sufficiently progressed to meet your programming objectives. So far, we’ve been able to meet that goal. When the Europa Pioneer Plan began last June, we forthrightly told you that we didn’t know how long it would take to complete RADE, but that we were asking you for a one year commitment to see how far we could go in that amount of time. That year is up and it is time to assess our progress. The first months were dedicated to a complete implementation of Design Mode AppleScript. This is something Apple told developers to do back in the 1990s, but like many ideals, it was always ignored as more pressing needs were dealt with. But in order to properly make the leap to macOS, this had to be addressed first, even before we could begin the graphic interface overhaul. Seven months later that task was 99% complete (there are a few bugs left to be swatted) and for the last five months, we have been laboring to bring as much of the graphic user interface as possible online for macOS. When we began the Europa program, we had no idea of how much it would cost to finish macOS RADE, and what it would ultimately cost to purchase a new copy or upgrade from an older version. But our formula was straightforward: however long it took, a new copy of Helix RADE 6.2 would cost at least what the Europa Pioneers paid for it, which is $20.00 per month, or $240.00 as of today. Of course, the product is still not finished, but the path to completion is clear, and to finance the work, the Europa Pioneer Plan will be extended for another year, beginning today. The first fruit of that renewal will appear when Preliminary Release 13 ships in July. If you are already a member of the Europa Pioneer Plan, we will be sending you an email shortly telling you how you can sign up for another full year for $200.00* — the same amount as last year — or you can continue making monthly payments of $20.00, just like last year. For those out there who haven’t joined us yet, you can get the current version of RADE and all of the progress we make through the next 12 months for $440.00. That’s $240.00 for the first year plus the discounted price of $200.00 for the second year. If you would rather make monthly payments, you can do that instead for $40.00 per month. Now, we fully expect that we will finish RADE before the second year of the Europa Pioneer Plan is completed. At that point, the Europa Pioneers will be considered to be paid in full — with any balance applied as credit accrued toward the next upgrade — and the official price will then be set at some level higher that what the Europa Pioneers have paid. A mixed bag awaits us in Preliminary Release 13. We had hoped that the final pieces of the index, sequence and post icons would be part of Preliminary Release 12. Had we not run into the problems we described in the June 8th edition of The Latest Word, they would already be in your hands. In the April 10, 2012 edition of The Latest Word, we solicited input from users who might have enough interest in View by Icon to convince us to take a detour in that direction. While a number of potential sponsors responded enthusiastically, the amount of money they were collectively willing to commit would not cover the cost of getting it done. This should by no means be interpreted as saying that View by Icon is not coming back. It will. Just not yet. As we noted in April, it is not as big a project as we had feared; it is, however, still a significant one. If you agree that View by Icon is an essential part of Helix, one you would like to help fund, but didn’t contact us about underwriting it, please contact Gil directly at your earliest convenience. Since View by Icon isn’t absolutely essential to getting RADE running in macOS, we won’t work on it ahead of schedule unless the demand — and the funds — are there. On another front, complaints about the inability to run Helix Utility on a machine running macOS 10.7 (Lion) and soon macOS 10.8 (Mountain Lion) are beginning to rise from a low growl to a distinct roar. For that we need an Intel-native Helix utility application. This is something we have been working at over the last year, while waiting for the last minute bug reports that precede each release. A modern utility is important for another reason beyond simply solving the Lion/Mountain Lion problem: breaking the 4 GB collection size limit for existing collections. Back in 2005, when we raised the limit from 2 to 4 GB, we actually completed the work in RADE that allows collections to grow to 64 GB. Unfortunately, it only works for new collections; the real need is to be able to expand existing collections that are now approaching 4 GB. The current utility has, for a very long time, had the “Compress Collection” command that reduces the size of a collection after you’ve deleted data. That makes the new utility the natural place for the “Expand Collection” command that will be used to break past the 4 GB limit. An Intel-native utility is the next step toward that goal. With the foregoing in mind, we recently decided to raise the priority level on this utility, increasing the focus on it over the last couple of weeks and then diving in head, hands and feet as soon as we knew Preliminary Release 12 was at last ready to go. We expect to begin beta testing it later this month. 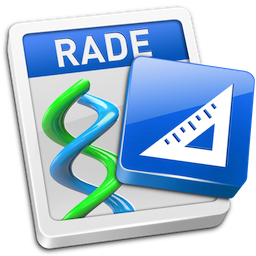 Even with the renewed focus on the utility application, Helix RADE Preliminary Release 13 is still on track for July. The plan for this release is to complete the posting icon and address any pressing bugs that have been reported. Preliminary Release 14 (August) is where we expect to introduce a new interface element that will provide the necessary infrastructure for the rest of the icon editors. If all goes according to plan, Preliminary Release 15 (September) will debut the index and sequence editors, which will give you a concrete look at how this integrates with macOS RADE’s evolving Design Mode paradigm. At that point, only three critical pieces of the Helix puzzle will remain to be put into place. Each one plays a major role in distinguishing Helix from any other application building tool. And each one has seen its fair share of perils in the evolution of Helix. The user icon is what enables a collection designer to create a ‘user experience’ that shields the end user from the underlying icon structure. The ability to build a custom interface, with menus, hierarchical menus, command keys and custom permissions has always been one of the hallmarks of the Helix toolset. The macOS User Editor is being designed to deliver the requisite functionality while opening the door to future enhancements we have been discussing and shaping for years. Properly addressing all of the template icon’s shortcomings is, by itself, a job that could easily be nearly as big as bringing the rest of RADE to macOS. Much of the foundational work needed to accommodate this task has already been done, but the ideal, world-class Helix template editor will have to come after the completion of Europa. The initial Europa template editor will certainly be different; in some respects it may even be better. First and foremost, however, it must hew as closely as possible to the goal of preserving Classic compatibility, while setting the stage for the day we can extend the designer’s ability to create a user interface that does precisely what he or she wants, without compromise, for use on a Mac, an iPad or an iPhone. Finally, there’s the abacus, the heart and soul of Helix. If there is something in Helix no one wants to see changed, this is it. But the Abacus Editor is built entirely around QuickDraw, and Apple has ‘deprecated’ (killed off, to be plain about it) QuickDraw, and it simply doesn’t run anymore. One of the reasons we are saving the abacus for last is because we want to know as much as possible about working in macOS so that we can make sure to preserve as much of the Abacus Editor’s flair as possible, despite the fact that we have to rewrite it completely from scratch. This last part of our journey promises to be far and away the most exciting. But let’s not get too far ahead of ourselves. All we can say right now with a high degree of confidence that sometime within the next year, the long march to macOS RADE will finally be over. We have accomplished much in the first year of Europa, and none of it would have been possible without the aid of the Europa Pioneers. Your contributions, both financially and by field testing and reporting, have been invaluable and we thank you for it. You now know what remains to be done. It is going to require a significant investment of time and energy, and the subscription plan will only get us through it if more Helix users participate. This close to the end of such a monumental undertaking is not the time to quit. But it is time for the rest of you to get on board. If you are still sitting on the sidelines, it’s time to get off the bench and into the game. If the cost is daunting, talk to us; we can work something out. If one of the things you love about Helix is that it keeps on working without your having to constantly pour your hard-earned money into upgrades, make an exception this time. The Helix you have loved and depended on for so long needs your help more now than ever. The end is in sight and the future is at hand, but we need everybody to join the team. Everyone plays and we all win.